Leadership Development Profile | Cleveland Consulting Group, Inc. This profile contains information designed to offer you developmental perspectives about yourself and how you operate as a leader. How valid and reliable is the Leadership Development Profile? In this issue, we continue to look at the developmental stages of leaders utilizing the Leadership Development Profile1 created by Suzanne Cooke-Greuter2 and Bill Torbert3. In my work, I use a variety of assessment tools, including development assessments, to get a sense of what is the primary frame of perception driving the executive. Often, when given a developmental view, it enables the client to sense a new way of being that might be possible. Using the work of Harthill Consulting, the base for the work of Bill Torbert, we will explore adult development and the creation of action logics that depict each stage of development. In the prior issue, we explored the alchemist action logic. In this issue, we will include a sample report. The Leadership Development Framework describes nine sequential changes in how a person interprets events, or makes meaning. Research and our extensive experience confirms that most people develop the Action Logics in the order presented. Once an Action Logic has been assimilated it remains a part of the person's meaning making capability, even as later and more integrated logics are adopted (just as when a child learns to run it doesn't cease to be able to walk). The Leadership Development Framework provides a way of understanding how a leader or manager is likely to interpret situations and thus how they may act. Although people draw their understanding from multiple Action Logics, we can usually describe one, and sometimes two which are dominant. People may be in transition from one Action Logic to another or rooted firmly in one central logic. In stressful times adults often revert to behavior associated with earlier Action Logics because of unconscious patterns. People may choose to act from earlier Action Logics if the situation demands it (in a robbery Diplomat behavior is a lifesaver). In contrast, behaviors associated with Action Logics later than a person's current logic cannot be consistently summoned forth. 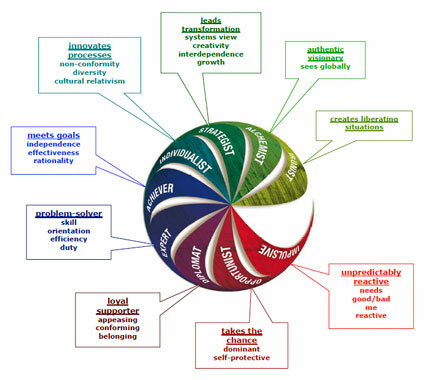 The Leadership Development Framework offers a chance to reach deep personal understanding and the option to identify unique developmental challenges. The Leadership Development Framework does not provide a once-and-for-all label which describes a person fully. It does not predict how people will behave in particular situations. It does not predict whether or when a person will transform to another Action Logic in the future. It is important to understand that this framework is not a guide to increased happiness (or even wealth). Each Action Logic has its own merits and difficulties, beauties and shadows. There is no evidence that later stages bring more joy or greater satisfaction from life, only that the nature of what delights and what causes suffering changes. However the framework does give some very reliable pointers as to the qualities and types of leadership capability an individual may have. The Leadership Development Framework describes crucial sense-making processes by which people interpret and give meaning to their experiences, and then structure them into more-orless coherent worldviews and characteristic patterns of action. We describe these worldviews and characteristic patterns of action as 'Action Logics'. Your primary Action Logic has a profound impact on your leadership approach and capability because it affects where you place your attention, your underlying assumptions, what inferences you draw and, crucially, the actions that you take. The Leadership Development Profile identifies your primary Action Logic – that is, the most complex Action Logic that informs your thinking and action on an everyday basis. As you become more aware of how this Action Logic influences your behaviour, you may discover that you also have a characteristic 'fallback' Action Logic when you are tired or otherwise vulnerable. You may also find yourself quite motivated to move toward the next Action Logic in the sequence once it becomes more explicit to you in the following pages. The distribution and nature of your responses on the sentence completion form indicate that your current Action Logic is that of a Late Strategist. With experience and insight over time your meaning making has transformed from one Action Logic to the next. At each development you have preserved the insights and knowledge of the earlier Action Logics, from Impulsive onwards, and added new meaning making capacities. At the Strategist stage people become adept at creating shared visions among people and teams at all Action Logics – visions which support and encourage personal and organisational transformations. To the Strategist social, organisational and personal change is an interactive development process that requires enhanced attention at multiple levels and they seek to cultivate this awareness within themselves. Strategists are increasingly guided by principles which inform their actions, such as seeking increasing mutuality of power with colleagues. The longer term future increasingly concerns them, but this is part of a dance which moves between the present moment (where we must live) and the future, which we are ever creating. Strategists will work to create and live by ethical principles and practices well beyond their self interest or the limited interests of their organisation. Strategists are adept at dealing with conflict – they understand conflict to be a natural product of organisational structures and personal differences. They see conflict as something to be engaged in, understood and resolved as part of a creative process. Their ability to understand and empathise, without sharing, the viewpoints of other people enables them to be key in moving to previously unseen solutions. Furthermore, Strategists recognise and work with their inner conflicts; they observe their own psychological wellbeing and strive to cope with, and / or transcend, inner struggle. As such they are capable of acknowledging the various parts of the self, including their shadow sides. 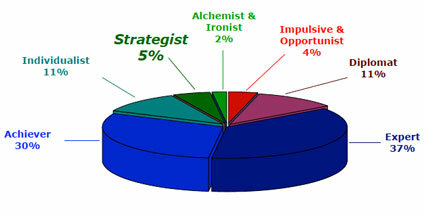 Strategists are often alive to the unique qualities of each situation. Rather than being followers of rules and regulations they work with multiple perspectives. They value the input of others, acknowledging the partiality of their own views and welcoming new triggers for change. This finds expression in their preference for working collaboratively and engaging with others different from themselves to develop shared visions and original enterprises. Aligned to this openness is an appreciation of others' need for autonomy. They recognise that different people see their world differently and they readily work with them, giving them space to grow, develop and find fulfilment and their own solutions in a way that is appropriate to each person. The commentary that follows is unique – it has been written for you about the themes emerging from your 36 sentence completions. This personalised commentary has been written in a spirit of invitation and inquiry (rather than as an authoritative statement of 'the truth'). It is intended to provide support and provocation in exploring your thinking, actions and opportunities for growth. Analysis of your sentence completions indicates that you reason from Late Strategist action logic. This suggests that whilst your reasoning is grounded in the Strategist frame you display strong qualities of Alchemist logic. Characteristic of the Strategist frame you perceive events as multifaceted; you observe contrasting possibilities and embrace personal and societal views (see, for example, sentence stems #1, 4, 7, 8, 9, 21). Aligned to the above, you allude to the systemic nature of life; you express sensitivity to the connections between the individual, the group and humanity. Your attention roams across time frames as you draw on personal experience, consider future possibilities and note a desire to stay alert to the present (#1, 2, 5, 14, 20, 28). You express throughout your profile a belief in non-judgement whilst appearing to hold strong, self-evaluated standards (#35, 28, 18, 16, 15, 10). Are you conscious of holding an order and structure within your reasoning? A developmental step, should you choose to take one, might be to observe your thought habits; to note, for example, the limits of reason. Self-reflections into feelings and concerns bear more of an Alchemist tone (#13, 28). Finally, you take expressions of tolerance for individuality into the later realm by virtue of your acceptance of the world and its paradoxes (#24). We can provide comparative data for two population samples. The first is a mixed group consisting of leaders, managers, supervisors and students taken between 1980 and 1995, predominantly in the US. The second group consists mainly of leaders, managers and consultants who have been profiled between 1993 and 2009, predominantly in the UK. As you compare yourself to the samples above please consider these differences between the samples. Sample A contains relatively fewer people in positions of seniority and the average age is younger than sample B. Sample B is highly selective – managers, executives and consultants who have been profiled because they are engaged in personal or organisational development. 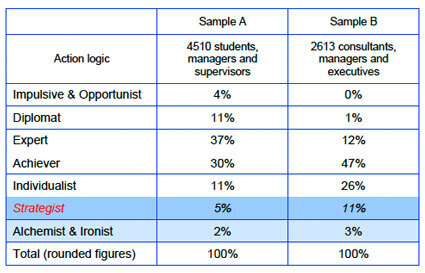 Consequently, sample B is atypical, with many people profiling at the later Action Logics of Individualist to Ironist. 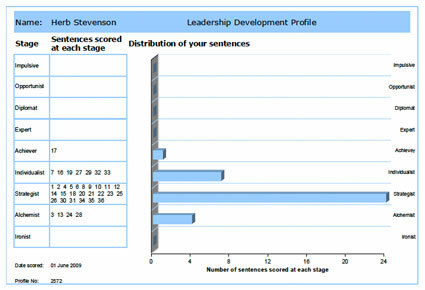 The Leadership Development Profile offers rich information about your current Action Logics. You may want to focus on becoming more effective within your current dominant Action Logic and on activities that can help you move towards the next Action Logic. You profile as making meaning at the late Strategist Action Logic. Typically, Strategists are concerned with seeing the world as a dynamic system of interrelated processes and relationships. They have a heightened awareness that individuals can maintain a distinct identity whilst being part of a community; playing a transformational leadership role in single conversations as well as on a larger and longer-term organisational scale. By way of contrast, while continuing to participate in conversational and organizational change, the evolving Alchemist becomes more concerned with a moment-to-moment listening both back toward the origin of attention and out toward societal myths and archetypes that invite transformation. Search out colleagues and networks that can support and nurture your exploring your 'way' of being. Treat at least one of them as a serious ongoing community of practice where you can explore your leadership tactics, strategies and underlying assumptions. Pay attention to the breadth of your life context, noting the historical, cultural juncture in which you live. Above and beyond your particular profession and your sense of your career, ask yourself what is your vocation? What are you called to do? How does this inquiry affect your job and career priorities? Challenge yourself to reflect in new ways about work and life dilemmas, including exploring the question "who am I". Use a range of different methods to challenge and extend your awareness - such as the I Ching / Enneagram or the provocations of others. Work to expand your systems thinking and how it can be used to intervene and create. Authors like Block, Senge and Hammer can help you flesh out what this direction entails. Observe more how each person is but one part of the system - appreciate your interrelatedness and be conscious of the inevitable limit of your understanding, however strategic it may seem to be. Develop a conscious use of freedom and passionate detachment – take a principled stance in relation to perceived injustices and embody that principle as you take action on it. Become aware of various aspects of your shadow – the ambiguities present in your character and how they affect and are, in turn, affected by others and the situation in which you live. Note how you relate to time – how has this altered during your life span? How do you interweave tasks with different time horizons – emergencies, routines, innovative projects, strategic initiatives, legacy questions? How may you continue to develop/adapt this relationship? Inquire with others into the practical applications of your visions – how can you make what you dream of become a reality? Seek out practices and personal disciplines that heighten your awareness and continue to question your assumptions – these practices may be from any aspect of life; sport, meditation, dance, etc. Pay heed to the balance that you strike between your creativity, desire for reflection and meeting your goals, between the tug to 'be-here-now' and to deliver what you and others seem to require. Seek to assess the impact of your actions across the dimensions of self, immediate colleagues and more distant affected third parties and across time scales that reach from immediate to far distant. Find support for, and avenues to express, the struggle of your journey. Explore with others, of like minds, who have experienced the trials of self discovery. Seek members of your community or practice who wish to work together to mentor one another's continuing development. Explore how your 'way' of being interrelates with those around you - what is the impact of your insights on others? Are you distanced from them, is your personal potency disruptive to their self-development and inquiry? Create more space in your life for contemplation; engage in meditative practices or any practice that enables you to explore deeply within yourself and reconnect with your inner voice. Become 'aware' of empty mind – learn to live with and appreciate the gap in thinking when you are listening more deeply. See how cultivating such active empty listening contributes to your interventions. Be conscious of the constructed nature of 'things'. Test your attachment to your way of 'knowing' and interpreting the world. In particular, notice the assumptions within you which you operate inside organisations or institutions. Turn accepted notions of behaviour and processes inside out and reframe them for yourself and others. Play with a series of solutions to a situation even using the “what's the last thing that I would do?” (in order to give yourself an outside-your-action-logic-box option) If none of your other solutions are working, consider actually doing “the last thing that I would do”. Re-examine where you are holding onto theories and methods, however transcendent they may feel. Can you hold them more lightly in each action situation and put more emphasis on listening into the stuckness or movement of the larger living system? Be aware of your growing concern in each interaction and strategic opportunity about how to help people, teams and systems transform. Listen into the developmental process of your team, department or current change initiative, (Chapters 8-11 Torbert & Associates, Action Inquiry can be of use in this effort). Continue to remain open to transformative experiences – guard against the feeling of 'having arrived'. Be passionately engaged and alive to the possibility that all is just a construction. 1 I am indebted to Bill Torbert, David Rooke, Elaine Barker, and Jackie Keeley at Harthill for their gracious permission to reprint the descriptions of their leadership development framework, including the leadership action-logics that depicts the stages of executive development. Information in how to become certified in the LDF can be found on their website. www.harthill.co.uk. 3 See David Rooke and Bill Torbert, Seven Transformation of Leadership, in the Harvard Business Review for an abbreviated description of the action-logics of leader development. 4 See Fisher, Dalmar, Rooke, David, and Torbert, Bill, 2003 Personal and Organisational Transformations through Action Inquiry. Edge/Work Press.